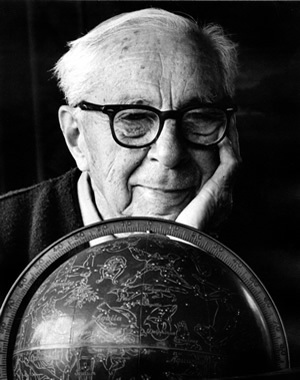 Chesley Bonestell (1888-1986) was an American pioneer of space art who helped popularize manned space travel. He is well known for his cover art for science fiction magazines, including Astounding Science Fiction and The Magazine of Fantasy and Science Fiction as well as many books such as The Conquest of Space, The Exploration of Mars, and Beyond the Solar System in collaboration with several authors well known in the field of space exploration. Bonestell's work also includes architectural paintings, scientific illustrations, and special effects matte paintings for films such as Destination Moon (1950), When Worlds Collide (1951), and War of the Worlds (1953). On June 11, 1986, while working on a painting, he passed away at his home in Carmel, California. Bonestell received a bronze medal from the British Interplanetary Society, a Special Achievement Hugo Award, and was inducted into the International Space Hall of Fame and the Science Fiction Hall of Fame. The Association of Science Fiction & Fantasy Artists' Chesley Award for achievement in science fiction and fantasy art is named for him, and a crater on Mars and asteroid 3129 Bonestell are also named in his honor.